If you are searching for a beautiful and quiet place for your well-deserved holiday, Balkan Jewel is the one. 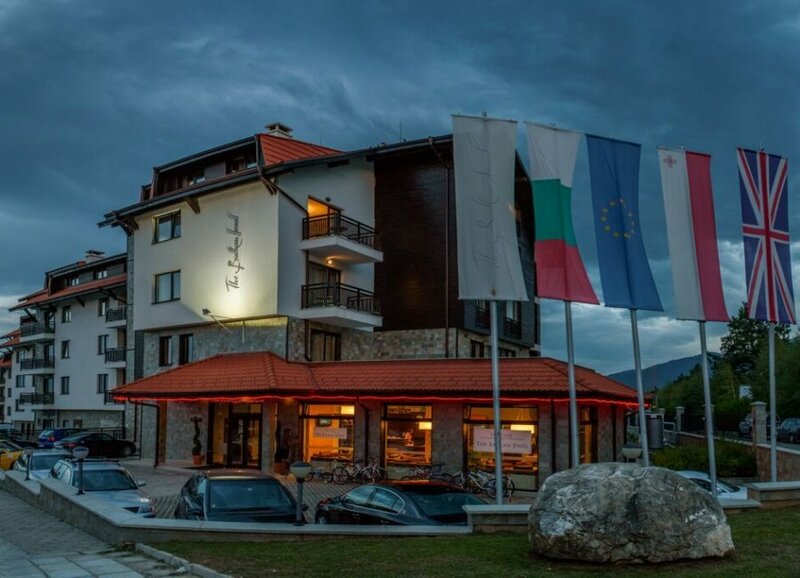 The 4-star resort is located in the Razlog valley which is surrounded by the three most beautiful mountains in Bulgaria, being the Pirin Mountain, Rila and the Rhodopes. It overlooks the stunning 18-hole Pirin Golf Course designed by the legendary golfer Ian Woosnam. The strategic location of the Balkan Jewel Resort and its proximity to Bansko makes it a desired all year round destination for active holidays, adventures, relaxation, family vacations or facilities for business events. The resort comprises of 160 comfortable studios, one-bedroom and two-bedroom apartments (including an apartment for disabled people), fully equipped with kitchenette, cable TV, free wi-fi internet connection, safe deposit box and telephone. Most of the rooms have balcony and fireplace. All common parts are wheelchair accessible. Your relaxation is extremely important to us. Besides welcoming atmosphere and tranquility at the foot of the Pirin Mountains, we offer a variety of spa treatments that you can indulge. You can combine these procedures with free access to the heated indoor pool and Jacuzzi, fitness, sauna, steam bath and the relax area. In the summer time there is an outdoor swimming pool and summer garden providing spectacular views of the mountains and the Pirin Golf Club. Balkan Jewel offers cozy entertainment places for our smallest guests as well as for adults – billiards, tennis and soccer table, indoor and outdoor playing area for children. Well- equipped conference room for 150 people is at a disposal of our business clients for organizing seminars, corporate events and team buildings. Courteous and well-trained staff will welcome you in our restaurant with 220 seats and offer you a variety of delicious traditional and international cuisine as well as a limited selection of Bulgarian wines. To make the most of your stay at the Balkan Jewel we offer free scheduled shuttle buses to the Pirin Golf Club, Razlog, Bansko and the Gondola ski lift. We can organize various daily excursions and entertainments such as: rafting, visiting caves, horse riding, fishing, paintball, picnic in the mountain, mountain hiking and biking, quad bike tours, Motor hang-glider tourist flights, off road tours, snowmobiling, skiing, playing golf, etc.